Blog›How to create a great press release? You can tell when you have a great press release in your hands. It’s ready to publish as it is, succinct, easy to understand and has an interesting topic with a clearly stated core point. A great release also has a clear and consistent structure that follows a pattern proven to be successful. 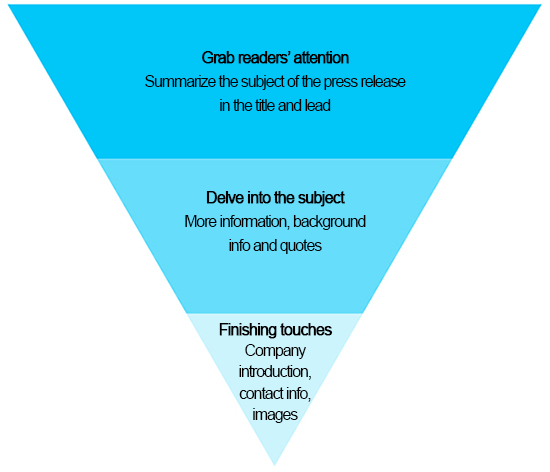 The best way to describe the structure of a great press release is an upside-down pyramid: The most important thing is to first appeal to the reader. Only after this you move on to a more in-depth approach of the subject. Ultimately, you finish the press release with the company's contact information, introduction and images. "Microsoft’s market value tops US$500 bn for the first time in 17 years"
A lead gets the reader acquainted with the subject. A good lead tells you exactly what the press release is about, or what the core message is. The most important point of the press release is presented in the first few sentences. A release with no clear meaning or theme in the lead most likely won't be read. The next two to four paragraphs should elaborate on the facts already mentioned in the lead. These paragraphs delve into the subject with more detail using numbers, product and event descriptions and quotes. Numbers are a great way to convince your readers of the significance of your operations. Visualizing stats with graphs and charts can make an otherwise dull subject seem much more interesting. Quotes can greatly increase the reliability of the release – especially if it is from an expert in the field or a partner of the organization. The quotes are not meant to offer new information on the subject, but rather to introduce an opinion or an additional point of view. A great press release fits onto one page, so there is no room for blabbering. Try to tell your story in a compact way. Unfortunately many press releases lack contact info at the end. Even a great press release can end up in the trash if journalists are not able to direct their questions anywhere. Therefore, add contact information, namely mobile numbers and email addresses, of one or two people at the end of every press release. Make sure that they are available after the delivery of the press release and are willing to provide additional information on the subject. The end of the press release is usually the perfect spot for a more specific company introduction. A well-made company introduction summarizes the company's operations and history in one paragraph. The introduction is meant to communicate with a few sentences what the organization is about and what its accomplishments and objectives are. At the end of a press release you should add links to your organization's website, videos, studies, and other material that supports the release. High-quality images and videos compliment a great press release. For example, photos of people or events, as well as expert interviews, bring additional value to a release – as long as they don't jam the receiver's inbox. Therefore, images and videos should be attached to the release as links and not attachments. The press release is ready, then what? Once the press release is ready, it's time to send it out to the world. No matter how well your release is constructed, it doesn't get published if it doesn't reach the right target audience. This is why you should make sure that the contact information of journalists are up-to-date and that your releases are targeted to the right groups of reporters. If you need help in publishing or distributing your press releases, contact us.